For your next art project, opt to shop local! New Jersey’s craft stores offer a wide range of supplies, with something for just about every niche art hobby out there. Whether you’re just looking to pick up some paints or you’re interested in participating in a workshop, find it all at the 10 best craft stores in New Jersey! This colorful art supply store is open seven days per week so you won’t be left in a lurch if you’ve left your art project till the last minute. Stocking Copic markers, acrylic paints, chalk markers, and more, you’ll truly find anything you might need and the friendly staff are always willing to help. Cute crafting gifts can also be purchased at Hudson County Art Supply such as Milan brand sharpeners, Klutz kits, and Crayola activities. AAA Hobbies and Crafts stocks an array of crafting items for a variety of different interests. They carry model cars and trains, arts and crafts kits, paint, and radio control car kits and parts. For those particularly interested in model building, AAA Hobbies and Crafts is really well equipped for this hobby as it stocks accessories, parts, after-market pieces, paints, and detailing needs. Jerry’s Artist Outlet is both a brick and mortar and online store selling practically any sort of art need you could imagine. Professional artists will find quality easels, canvases, an array of paintbrushes, such as acrylic, oil, and Sumi, as well as paints and tools. Children interested in crafting will also enjoy a visit to Jerry’s as it stocks DIY craft kits, project materials, and crayons. Wool & Grace is a shop focused on kitting and needlepoint materials and notions. The store also offers classes, including an 8-week beginners class for knitters, and knitting/needlepoint parties. If you’re a bit stuck with your current project, feel free to swing by Wool & Grace for free help! Also, if you find that you’ve run out of time to complete one of your own projects, bring it to Wool & Grace, as they can finish needlepoint and knitting projects. The staff at Knit’s Fabulous are all avid knitters or crocheters, and are passionate about sourcing the best yarns for their store. Thus, you can expect to find a wide array of yarns at Knit’s Fabulous including Rowan, Sublime, Juniper Moon Farm, and Tahki Stacy Charles. In addition, visitors will find classes offered daily as well as open knitting and crocheting times where you can work on your projects in the company of others. Open Tuesday through Saturday, swing by Yarn Diva to pick up yarn or needles for your next project. The independently-owned store stocks yarn brands such as the Alpaca Yarn Company, Baah Yarn, and Zen Yarn Garden. Kitting workshops are also frequently offered, allowing participants to learn new skills while creating a beautiful finished product such as a scarf, shawl, or cowl. Rows of Purl carries both finished products for purchase and necessities to make your own unique finished items. The store also offers classes and workshops including beginner crochet, crochet critters to make stuffed animals, and several scarf and shawl classes. Additionally, workshops are available about fibers, chart reading, and error fixing help. All materials for classes and workshops can be purchased right at Rows of Purl for your convenience. That Bead Place is a small boutique that stocks high-end beads that are hard to find elsewhere in the state including Swarovski, Pearls, and Czech glass beads. 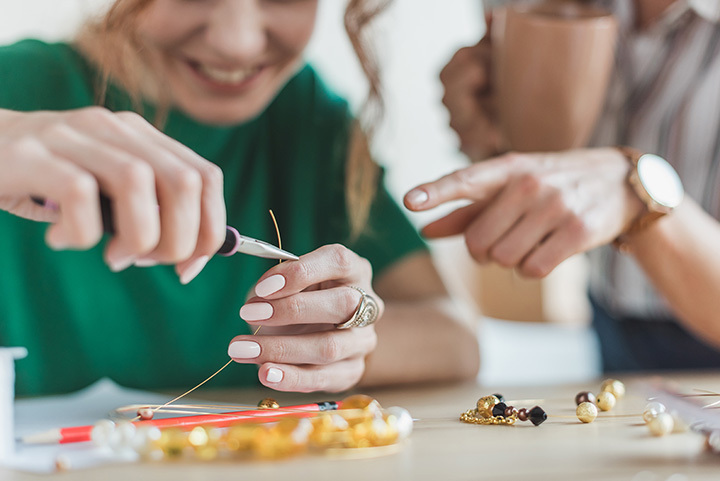 In addition to purchasing beads for your hand-made jewelry project, That Bead Place carries findings, such as those made from sterling silver or gold-filled, and stringing materials. Additionally, they carry locally made jewelry and offer five affordable classes and fun parties for either children or adults. Selling beads, custom jewelry, and kits, Lucy’s Bead Boutique is popular among beaders at all skill levels. Store-made kits include ones that you can pick up and take it home to finish and are suitable for beginner-level beaders. Classes are frequently offered and are listed in their newsletter and on the store’s website. Currently available classes include fish making with beads and sequins and several different bracelet classes. Open for more than 20 years, the Birds and the Beads stocks beads, supplies, and books about jewelry making and bead crafts. Loose strung beads available in-store include Japanese seed beads, shell and wood beads, stone pendants, and amber. Classes are also available although none are currently on the schedule.